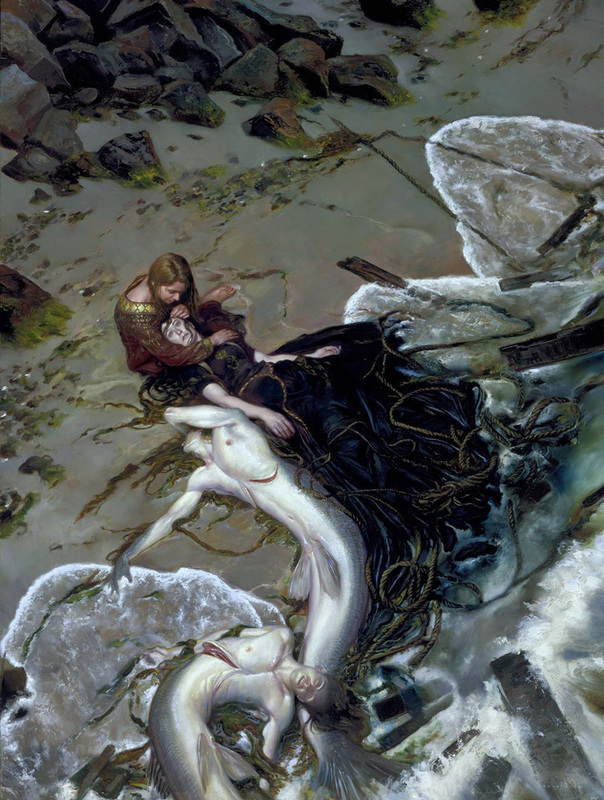 Here's a visual history of the winners of the Hugo Award for Best Professional Artist. 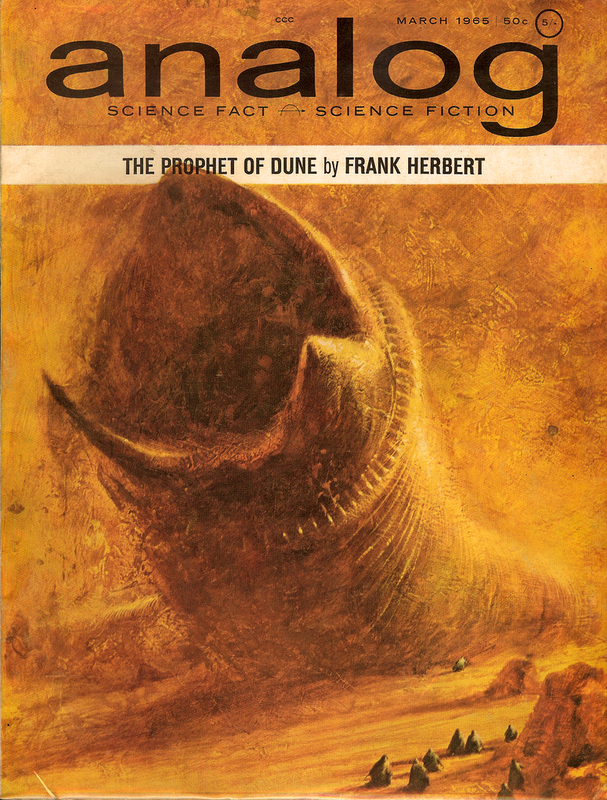 The Hugo Awards started in 1953. However, the Best Professional Artist category wasn't created until 1955. 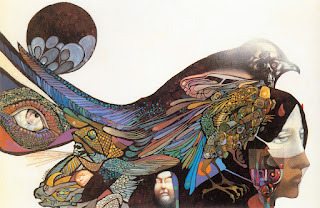 Since then, seventeen pro artists have been recognized with the award in that category (eighteen if you count Leo and Diane Dillon as individuals -- debatable because they considered themselves inseparable -- even though each was/is a powerhouse individual artist). It's a helluva list. Two Sundays ago, I became a part of it. After assembling this set of images, the first thought I have is "get back to work....go get better." And the next -- "this still feels like a dream." Frank Kelly Freas: Much of his work had a whimsy that resonated with legions of fans. However, that's largely absent in this one. This is his artwork for Robert Heinlein's THE GREEN HILLS OF EARTH and it's always been my favorite Freas. He won the Hugo in the Pro Artist category ten times (1955, 1956, 1958, 1959, 1970, 1972, 1973, 1974, 1975, and 1976). 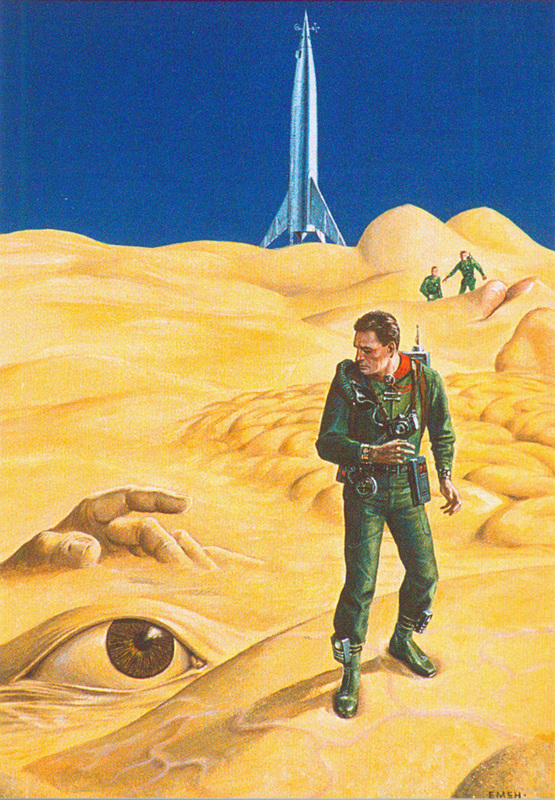 Ed Emshwiller: This is the cover art for F&SF, June 1960. Emsh was a master of the strange, and this one speaks to its time, but yet still holds up today for sheer strangeness. I had the honor of inducting him into the Science Fiction Hall of Fame in 2007. He won the Hugo in this category four times (1960, 1961, 1962, and 1964), as well as a fifth Hugo as "Best Cover Artist" (tied with Hannes Bok) back in 1953 before the Pro Artist category was created. Roy Krenkel: He painted several classic Tarzan covers that are much beloved by many sf/f fans, but for my money, it's his pen-and-ink work that pops in my mind. I've never met an artist that didn't love what he could do with that medium. He won the Hugo Award in 1963. 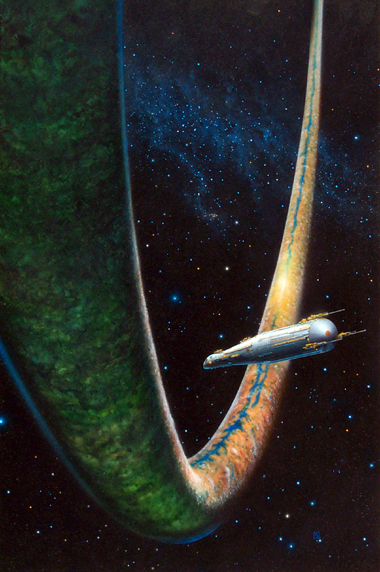 John Schoenherr: This painting evokes the same feeling I get when I see photos of F5 tornadoes. There's an iconic majesty and terror in this image and I think it's still one of the definitive DUNE artworks. Schoenherr won the Hugo Award in 1965. 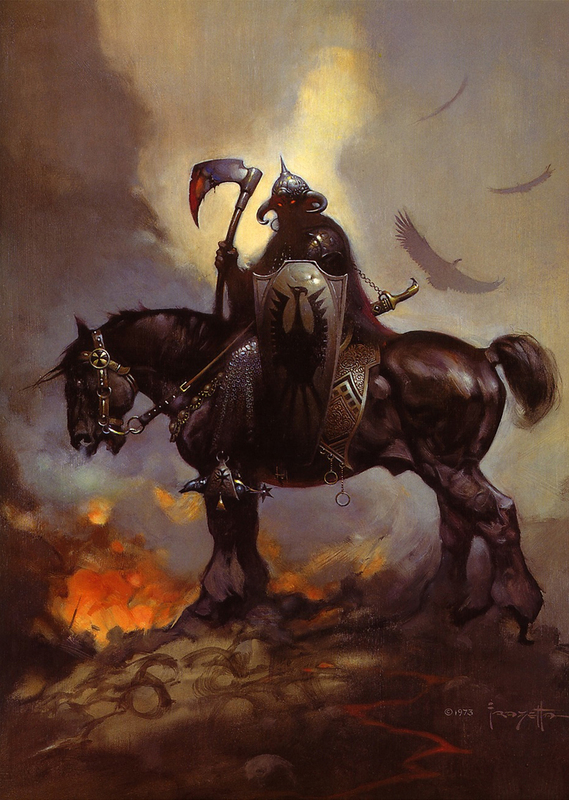 Frank Frazetta: The only thing that shocks me about Frazetta and the Hugo Award is that he didn't win more than one. He's one of those seminal master artists that influences almost all genre artists, whether they realize it or not. He won his Hugo Award in 1966. 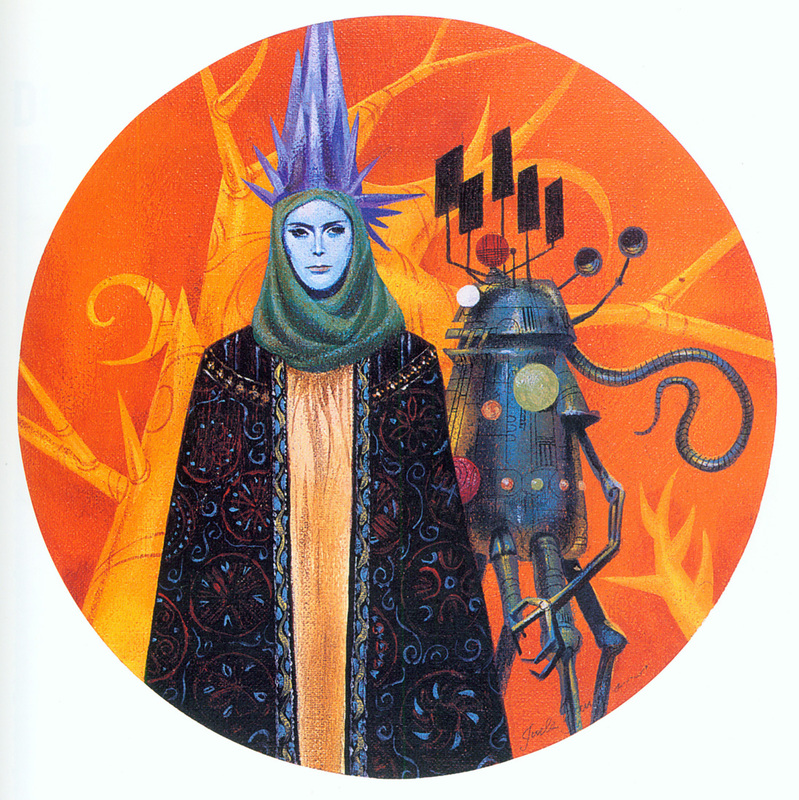 Jack Gaughan: There's always something quintessentially funky and exotic about his work that I greatly admire. I look at a picture like this, and it's both dated and timeless all at once. That's a tough trick. Gaughan won the Hugo Award three times -- 1967, 1968, and 1969. Leo and Diane Dillon: I love this one -- the wraparound cover art for Harlan Ellison's DEATHBIRD STORIES. The Dillons are the only art team to be recognized with a pro artist Hugo thus far. I like this quote from Diane: "We could look at ourselves as one artist rather than two individuals, and that third artist was doing something neither one of us would do. We let it flow the way it flows when an artist is working by themselves and a color goes down that they didn’t quite expect and that affects the next colors they use, and it seems to have a life of its own.” They won the Hugo in this category in 1971. Rick Sternbach: He did production work for the first STAR TREK motion picture back in the '70s, and that's where I'm most familiar with his work. 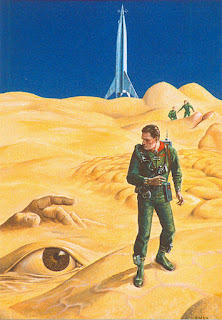 However, he also did a range of sf book art. "Moonbow" (above) is my favorite. He won two Hugo Awards, in 1977 and 1978. Vincent Di Fate: There's something unmistakable about the way Di Fate lays down his hard edges against softer textures. 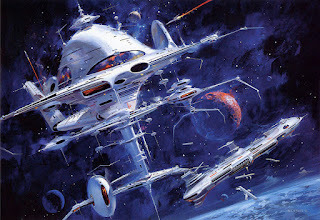 I love his ships and spacescapes. This one is from later in his career (2002? ), but he won the Hugo Award back in 1979. Michael Whelan: He's one of the ultimate artist's artists. 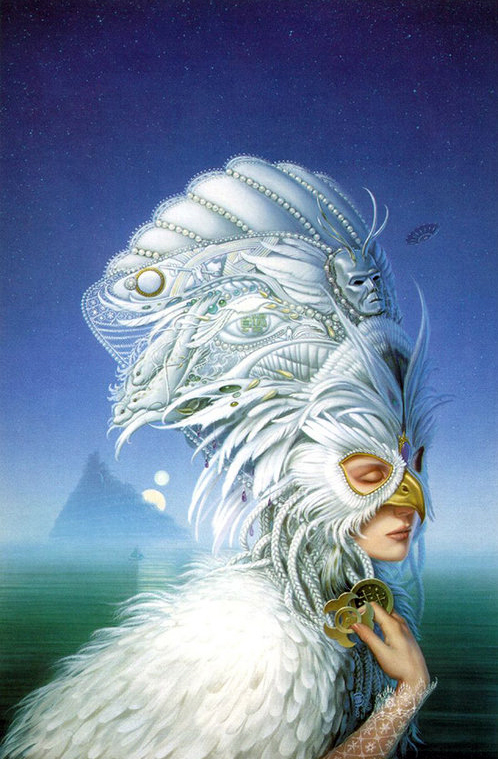 And this is one of my favorites of his -- the cover art for Joan D. Vinge's THE SNOW QUEEN. A couple of years ago, he brought this original to Boskone. I stared at the lace on that arm for a solid five minutes -- without blinking. LOL When I think of the ambassadors of the sf/f field, Michael will always be one of the greatest -- as an artist and as a person -- and that includes all authors and creators, bar none. He's won the most pro artist Hugos -- thirteen -- 1980, 1981, 1982, 1983, 1984, 1985, 1986, 1988, 1989, 1991, 1992, 2000, and 2002. 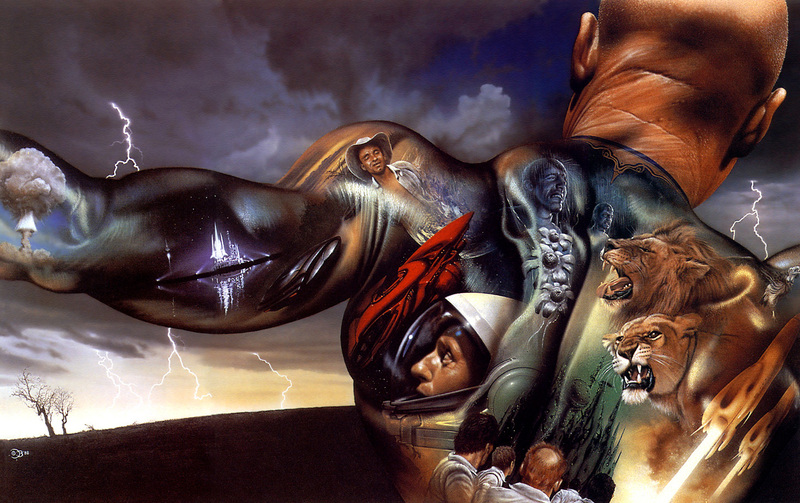 Jim Burns: I fell in love with this image the moment I first saw it a couple of decades ago -- Burns' classic cover for Ray Bradbury's THE ILLUSTRATED MAN. If I had to make a list of top-20 favorite sf artworks of all-time, this would be in there. Jim has won three Hugos in this category -- 1987, 1995, and 2005. 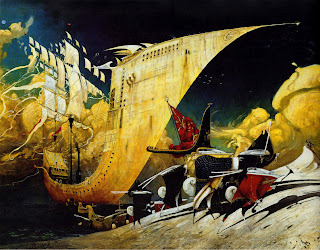 Don Maitz: Whenever rum drinkers chug a bottle of Captain Morgan, they get up-close and personal with Don's art. 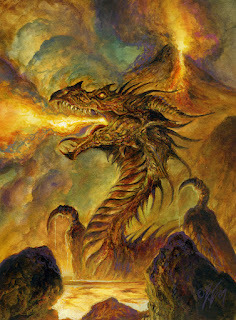 However, works like "Death of the Last Dragon" are where he shines brightest, in my opinion. This is one of my favorites of his. He's won two Hugo Awards in this category -- 1990 and 1993. Bob Eggleton: And here's a dragon of a completely different mode. 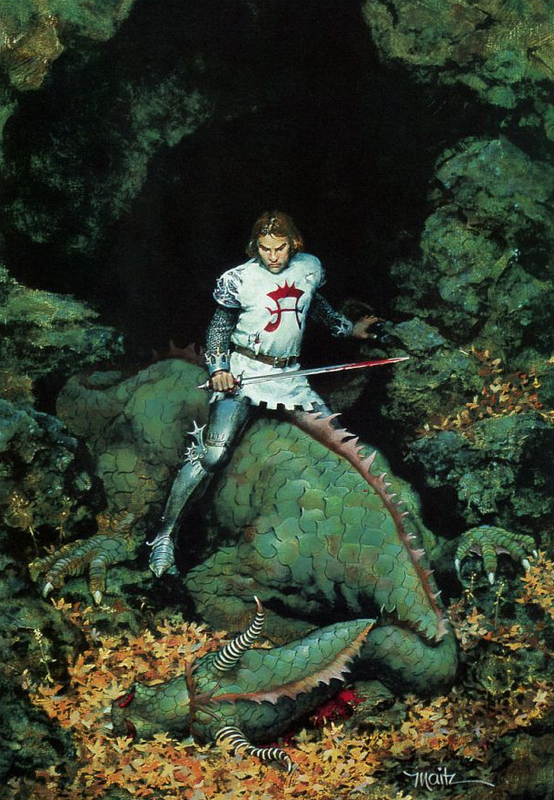 Yes, Bob's known for these as well as his Lumley covers, his Godzillas, his Cthulhu art, and his love of pulp, amongst other things. But when I look at an Eggleton, I see the craft of brushstrokes and accretions that are dripping with emotion, and with the pure love of someone who's never stopped being a fan. And that's why he's a master pro. Bob has eight Hugos in this category -- 1994, 1996, 1997, 1998, 1999, 2001, 2003, and 2004. Donato Giancola: Along with Whelan, I consider Donato one of the great artist's artists, and one of the best of all pro artists I've ever met. I love how he handles himself as an artist and as a pro, and this cover artwork for Kathleen Bryan's THE GOLDEN ROSE is one of my favorites of his. I was flabbergasted when Donato lost seven consecutive years for the Hugo from 1999 to 2005, until he finally won his first Hugo, on his eighth nomination in 2006. (And yes, now I know a bit of how he felt -- that math does sound eerily familiar, come to think of it. ;)) He now has three in this category -- along with the 2007 and 2009 rockets. Stephan Martiniere: As far as I'm concerned, he's the master of the futuristic cityscape. 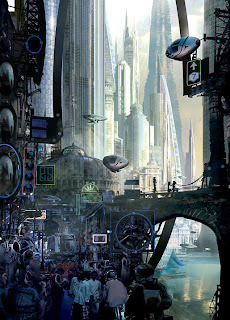 This is his cover art for Ian McDonald's RIVER OF GODS. 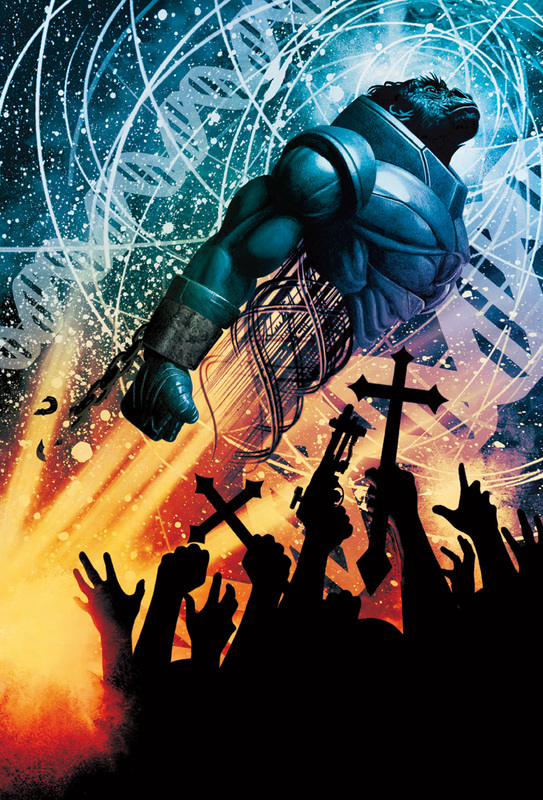 There are many artists that do this type of imagery so well, but I can't think of any more transcendent than Stephan. 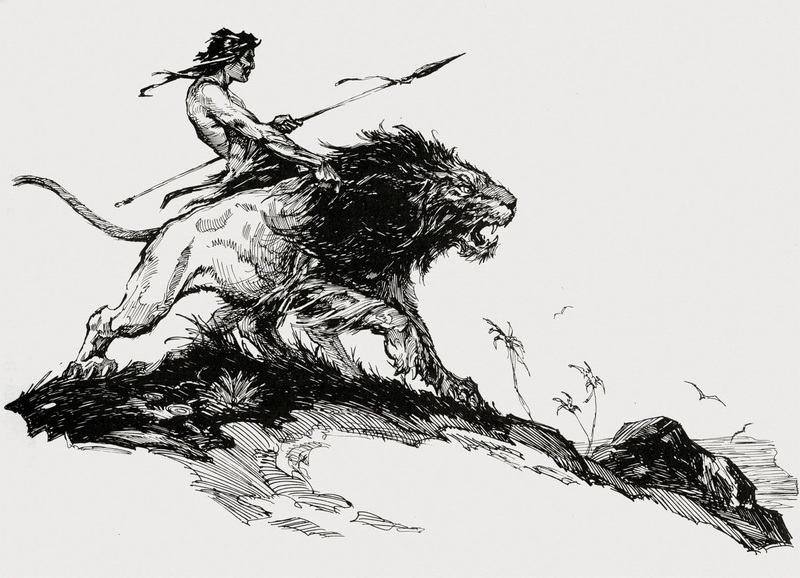 Even as some traditionalists and collectors decry the evolution and impact of digital art, Stephan has done what the great artists do in all media throughout history -- he has pushed the vocabulary of art forward, and that achievement goes beyond arguments over pencils, paints or pixels. He won the Hugo Award in 2008. Shaun Tan: What I love about Shaun Tan is that he made himself. His visions and narratives are uniquely his own. He didn't come out of a vacuum, but when I look at the evolution of his work from THE VIEWER through THE RABBITS (above) through THE ARRIVAL to the present, he re-shaped the world on his own terms and brought it to him, rather than vice versa. He has two Hugo Awards -- 2010 and 2011. John Picacio: And it's 2012. And here I am. Hello, world. And it's time to get back to work, to make new art, and to make better art. Don't look now -- I think my best is still yet to come. I believe so too, John. Congrats! I'd like to see you post on the nominees who did not win in the first 40 years of the Hugo (to prevent hard feelings on recent nominees who still may win). Hi, Mair -- I think I missed your comment initially because I was typing. Sorry 'bout that! 'Appreciated. :) Yeah, that dragon is one of Bob's best, I think. Agreed. Very cool, John. Thanks for compiling. Congratulations again on being added to that prestigious list of artists! Can't wait to see what you come up with next. Wow, I hadn't realized until just now that Powers never won. That's kinda mind boggling. Congrats again, John! Here's to you running out of shelf space to display all your future wins! I had forgotten Stephan had won in 2008, I somehow had it in my head that he was a Hugo bridesmaid like you were. I voted for you first, and him second on my Hugo ballot for that reason. You're a deserving addition to a club of stunning talent. Congrats! And great post. 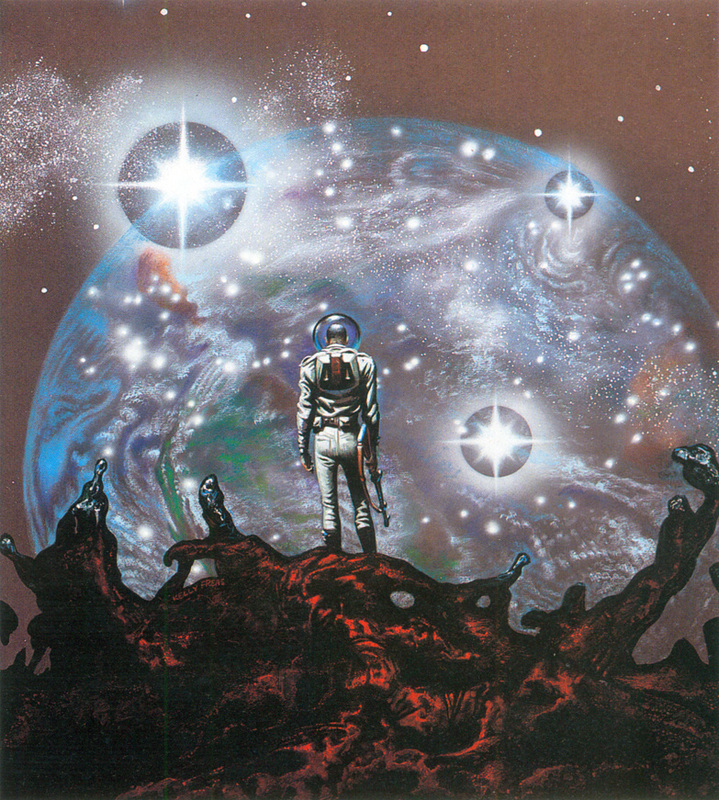 Sternbach's Moonbow illustrates a novella I wrote far back, and he's been the most evocative in deep space imagery. I'd like to see him back in the field! Congrats. I've been a fan for awhile and I was glad to see you win this. Man, this list was a blast from the past. John Schoenerr and Rick Sternbach were huge favorites of mine when when I was reading Analog and Galaxy in high school way back in the 70's. Typing in either name in Google brings back a ton of covers for issues I remember reading. Congratulation! Great work what great company to be in. I am surprised John Berkey wasn't on the list. Congratulations on your Hugo, and THANK YOU for this wonderful post! I am sharing it with others whom I know will enjoy it! This is an amazing post, John. Makes me want to go out and spend a fortune tracking down the books with these covers or this artwork inside. Great to see a visual representation of such great company, to which you now belong. Very proud of you and again very happy for you. Wow!! !